In a Getintothis exclusive, Peter Guy catches up with The Kazimier’s Venya Krutikov and Sam Crombie to discuss their most spectacular event to date, future projects and maybe, just maybe, an insight into the inner workings of Liverpool’s most innovative collective of creatives. 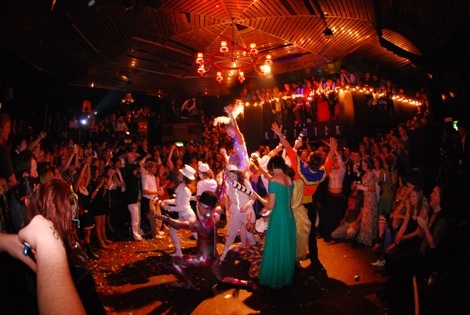 Sebastian Brueckner captures The Kazimier crowd in full swing during their 2010 event The Kronos Returns. First a bit of context. It’s another late night in Liverpool’s cultural hub, The Kazimier. Getintothis is discussing the latest in a four year wondrous waltz through projects developed by the Wolstenholme Square-based arts collective with club manager and unofficial skipper Venya Krutikov. Venya is positively close to self combustion due to the excitement of the event – and indeed the 16-hour days he and his Kazimier cohorts are investing into it. The project is Atalonia: a conceptual science fiction tour taking place in an abandoned warehouse in the Baltic Triangle. Unlike other Kazimier ‘parties’, it’s been commissioned by AND festival and takes place twice nightly for a week, culminating in a celebratory party. Also, unlike previous Kazimier creations, Venya is full of details, animatedly spilling information about what’s set to unfold. Yet contrastingly, the more we learn, the more we’re unsure of what to expect and more to the point, what Atalonia actually is. 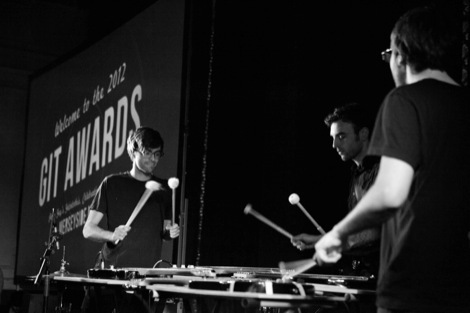 Mark McNulty captures The Kazimier’s Venya Krutikov (centre) with Wave Machines during Liverpool Sound City 2010. Later we talk to Sam Crombie, the Kazimier’s in-house sound engineer and one third of Dogshow – a techno band which fuses dance music’s past and present. His brother Laurie, another key player in the Kazimier’s team, and Venya complete the three-legged beat-orientated beast. Sam is more reluctant to go into specifics, but again reaffirms Venya’s claim about the epic scale and vast work load necessary to assemble Atalonia. He appears a mixture of both assured cool and quiet hysteria. Our appetite sufficiently whet, we’re invited for a pre-show tour and an interview is set up to preview the event. Regular readers will be aware Getintothis doesn’t do previews, but for this it was a no-brainer. Days pass, and eventually, due to the intensity of Atalonia’s workload we’re forced to wait until after the performance. But what a performance Atalonia proves to be. Getintothis gave an insight into The Kazimier’s spectacular vision on the second day of its week-long run – but felt compelled to withhold as much information as possible as to avoid spoiling what was a truly compelling artistic achievement. Combining fantastical elements from Jules Verne‘s Journey To The Centre of the Earth, Doctor Who, Lewis Carroll‘s Alice In Wonderland, Paul Verhoeven‘s futuristic cinematic nightmare Total Recall and Channel 4 cult gameshow The Crystal Maze, Atalonia’s conceptual journey transported audiences to a world within a world. 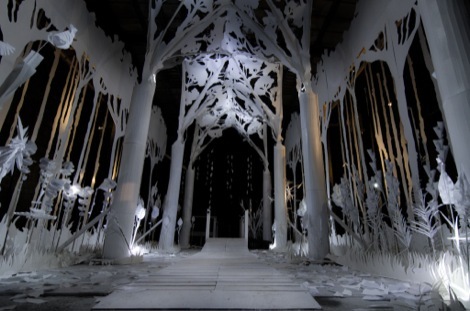 A world were 40 foot high gardens made entirely out of brilliant white paper were brought to life by choreographed illuminations. A land were a towering waterfall transformed into a siren who sang ancient languages engulfed by dark lakes. A place were sand beasts grappled and unlocked secret chambers. There was a gladiatorial arena were audiences are gripped by parading brass bands as an epic orchestra plays God-like thunderclaps all the while creatures prance with huge cylindrical lights flashing from every limb. 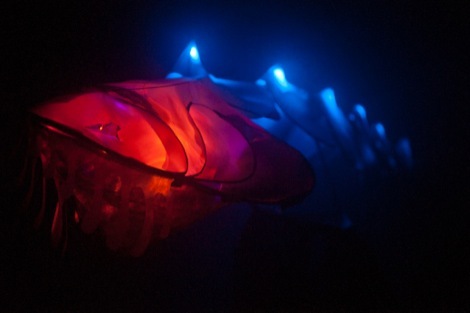 Finally, once the senses were truly awakened, you’re plunged into the depths of the ocean as 30 metre marine life emerge from the blackness culminating in a quite terrifying ride into the darkness… And then you’re out. Exiting through Atalonia’s tacky gift shop – a quite marvellously cheeky coda to an altogether remarkable voyage. It was no wonder the team were excited – and a little bit hysterical. Which brings us to now. Days after what promises to be the cultural event of the year, Venya and co catch up with Getintothis. Yet there’s to be another little ‘sting’ in the tail as Sam expresses our line of questioning is perhaps a bit too ‘radical’. Getintothis: Hello, hello. Let’s cut to the chase – Atalonia, your biggest project yet – has just finished, the results were spectacular. You must be chuffed with the feedback? Venya Krutikov: It’s been immense – the feedback we have had for this is really spectacular. Getintothis: Having spoken to you, it’s apparent how much investment you put into Atalonia, give Getintothis readers an insight into the work that went down and some of the problems or obstacles you had to overcome. Venya: The big problems were drilling bores and tough rock. The site for the show was huge. It was on a really different scale to anything we have tried before – going to the toilet involved getting on a bicycle! Atalonia was built on a shoe string budget – 90% of what was there was from recycled materials. We relied on the hard work and enthusiasm of the many people who worked with us. Getintothis: Atalonia was unlike any previous Kazimier event as it was built into a twice daily ‘tour’ – how did you retain the spontaneity of the event, were you concerned about secrets getting out? 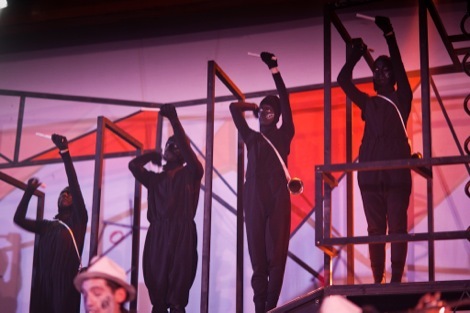 Venya: We had no concerns about the ‘secrets’ getting out because even though people had maybe seen behind the scenes or discussed the show, not many could comprehend what exactly it was until they had seen it for themselves. Even us. 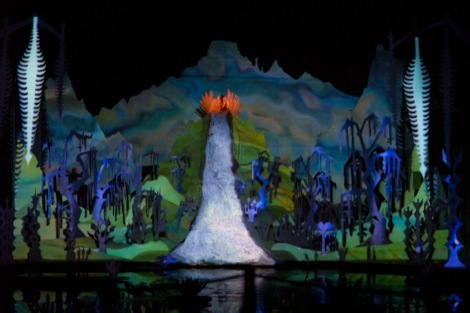 Photography during the tour was strictly prohibited but if the audience came out at the end of the show telling friends they’d just witnessed a singing waterfall in the centre of an underground lake I think people would find that hard to visualise. Everyone on the tour had their own unique experience and each tour group seemed to react differently as a collective. 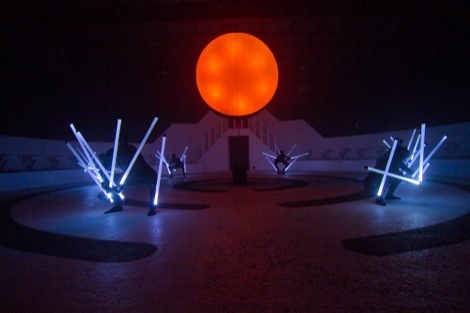 Getintothis: We thought the garden sequence was mesmerising, which parts were your favourite? Venya: Perhaps the giftshop at the end of the tour where the audience had the chance to discuss and digest the experience they had been subjected to whilst being presented with shelves of Atalonia branded tat. Having our very own Richard O’Brien (Paul ‘Tall Paul’ Robinson) to help guide them through their perilous journey was also a major bonus. Venya: Each one had a unique theme and the narrative of the event unfolded throughout the night with the guests being active participants in the show. Getintothis: It’s funny reflecting on when we wrote about a Kazimier party, the reaction we got back was so extreme. Pleasure at someone finally having championed the scene but also anger and disgust at having ‘let the cat out of the bag’. What was your take on it? Venya: The secret was only out because the headline said so… The content of the article was good. Getintothis: This element of secrecy has provoked some people to be suspicious, dismissive or downright anti-Kazimier – saying you’re a ‘clique’ or pretentious. How do you counter this, you must have faced some form of criticism? Venya: We just are what we are. We dont want to shout about it or force it upon people. If people critise The Kazimier for good or for bad we are happy to accept their opinions. Secrecy has never been intended. Projects with longevity need time to grow and promoting ourselves with A0 billboards around town wouldn’t allow people to feel like they might have discovered something they feel fondly about. THE KAZIMIER | Deconstruct | The Great Kazimier Carnival from Jack Whiteley on Vimeo. Getintothis: Liverpool may have been voted friendliest city lately but it can have a fiercely tribal mentality. Was being considered ‘outsiders’ or let’s say ‘non-Scousers’ an obstacle at all? Venya: Liverpool being a port city has always had an influx of people from other places and that’s part of the character here. The Kazimier was formed in Liverpool and embraces the city. We have never had much interest in entertaining an debate about being non-Scouse. Getintothis: Reflecting on all of your parties, if you had to be selective which are you most proud of and did any not go to plan? Venya: Imperium – Vistas Of The Future (the fourth The Kazimier) was perhaps where we best achieved what we set out to do – a blend of past and future and some of the best fancy dress we’ve seen. I don’t think there has been a single one that ‘went to plan’! Imperium shot by Mina Bihi. 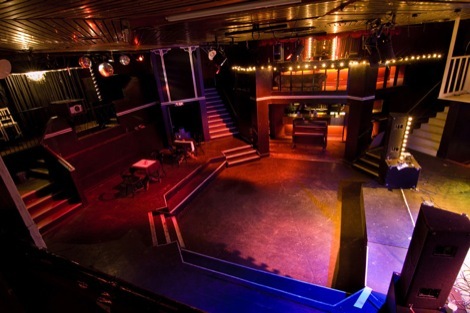 Getintothis: Over the last 18 months you’ve started using the Kazimier space as a touring venue. This is to facilitate the more leftfield side of your projects, do you think there’s any compromise in doing so? Venya: We’re not generally funded (Atalonia was part funded by AND Festival) so our projects have to be supported by the venue. We’ve so far managed to maintain a pretty exciting mixture of events and acts, so compromise has been minimal. We can no longer shut the club for a couple of months in preparation for one night but it has made us search out new and exciting spaces – such as the space housing Atalonia. 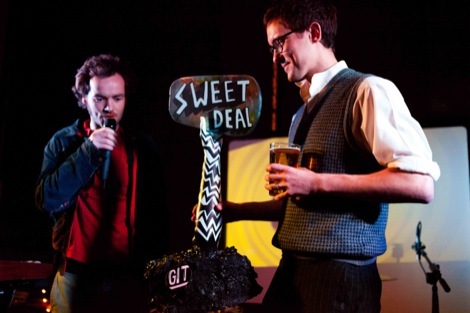 Getintothis: Have you had any nightmare shows or difficult artists? Venya: Difficulties? Bands are always happy but their crew sometimes take a while to get used to our non-standard technical set up – but they come around by the end of the evening! Getintothis: You’ve had a tremendously busy 2011 so far – who’ve been your stand out artists? 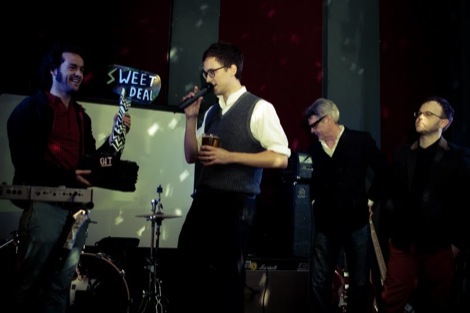 Venya: Highlights have included Charli 2na, Les Savy Fav (Getintothis review) and Metronomy. CHALI 2NA | Live at The Kazimier from Jack Whiteley on Vimeo. Getintothis: Talking of projects, earlier this year you launched Kazimier Records, tell us a little about the artists and how it’s going? Venya: The bands on the label include Simon Knighton, The Kazimier Krunk Band, Sing For Your Supper and Dogshow. 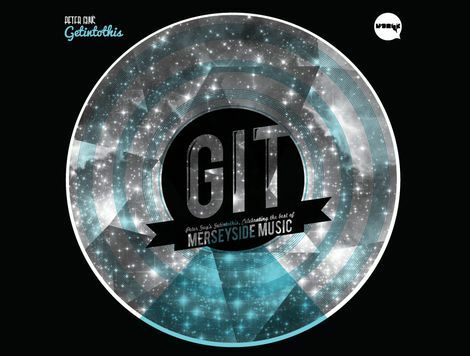 All have an album out and there is a compilation which aims to encapsulate the vibe of the label. Watch this space for the new year. Some of the musicians during Atalonia – many of which were from Liverpool favourites including Stealing Sheep, a.P.A.t.T and Emily and the Faves. 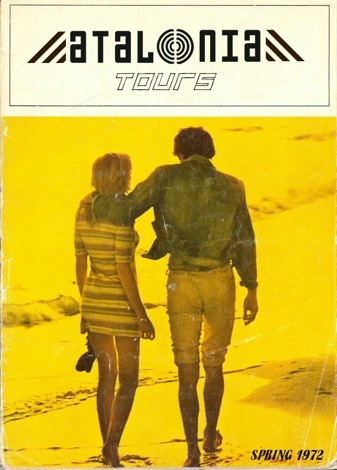 Getintothis: Let’s go back to the beginning. Venya, you’ve got a background in electronics (Venya’s website shows many of his designs here) and Sam you’ve always experimented in sound and visuals. 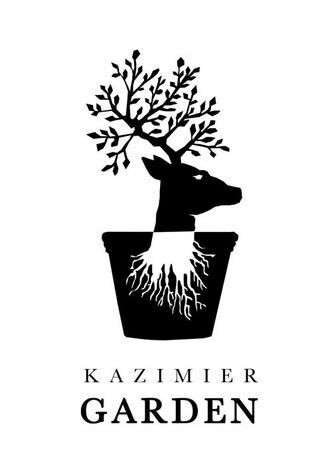 When were the first seeds sown into the formation of the Kazimier? Venya: The Kazimier is a five way team. (It’s later confirmed to Getintothis that the Kazimier team consists of Laura Brownhill, Michael Lill, Laurie Crombie as well as Venya and Sam). Getintothis: Sam and Laurie have composed for sometime too – your early Crombie music certainly reflects some of the music you’ve gone onto make with Dogshow… Remember Skag Dungeon!? 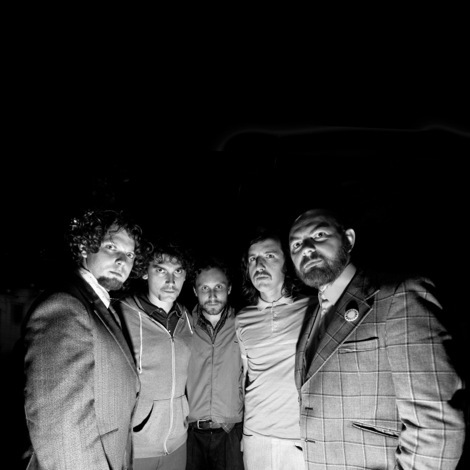 Getintothis: Have Dogshow any more plans to tour or record new material? 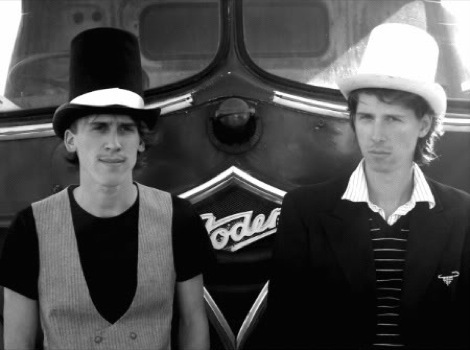 The Kazimier‘s brother’s in arms and Dogshow band-mates, Laurie and Sam Crombie. Getintothis: As a production company, Kazimier surely has the potential to do what companies like Artichoke (the team behind Capital of Culture‘s La Princess/Take That‘s stage team) do on a much larger scale – is this something that would interest you guys in the long term? Venya: We’re interested in pursuing our own projects for the foreseeable future. DOGSHOW | Split Screen Experiment from Jack Whiteley on Vimeo. Later in the week, we reconvene at the club as Fly With Vampires are shaking the Kazimier’s walls in preparation for Cloud Control‘s headline set. Venya greets us outside – grinning ear to ear, exuding a ‘you won’t get much out of us, son’ type of air. It’s something we look forward to. Almost as much as their next move. Oh, but there was one final ‘secret’ the Kazimier were prepared to declare – their favourite chocolate bar – Drifter… but of course.